I put Caddie Woodlawn on our readaloud to-read list a long time ago. I had grown up watching the 1989 Wonderworks film adaptation, and I think I'd read the book as well. It seemed like one we'd eventually enjoy reading, although I had no immediate plans for it. But then my good friend, Sarah, read it aloud to her five-year-old daughter, and she praised it so highly that it quickly bumped its way up to the top of the list. Caddie is something of a tomboy, growing up wild and free on the Wisconsin frontier in 1864. When her family moved there from Boston seven years before, she and her little sister, Mary, were both frail and sickly. After Mary died, Caddie's father decided Caddie needed to build up her own health in the great outdoors: "Harriet, I want you to let Caddie run wild with the boys. Don't keep her in the house learning to be a lady. I would rather see her learn to plow than make samplers, if she can get her health by doing so. I believe it is worth trying. Bring the other girls up as you like, but let me have Caddie." And so Caddie's mother does, although she's not always thrilled about it. Caddie swims in the river, makes regular visits to the Indian camp, goes hunting with her uncle, and plows the field with her brothers, Tom and Warren. Her father's plan works. She is happy and healthy and thinks she has the best life in the world. However, as she grows older, her mother insists on a little more propriety, which Caddie resists at first until she realizes she doesn't have to give up who she is and what she loves in order to become a lady. We were well into the book when we found out it's based on the life of the real Caddie Woodlawn, a fact I had forgotten (or never knew). We love fiction and are often quite inspired by it, but there's something special when you realize that a character's brave and honorable acts are actually founded in fact. I guess they mean just a little bit more. For example, let me tell you a little bit about the Hankinson family. When Sam Hankinson settled in Wisconsin, he married an Indian woman and together they had three children. As the town and surrounding area gradually grew more populated, the Hankinsons felt the harsh prejudice and judgment of the white families around them. Eventually, Sam's wife decides to leave her husband and children and return to her people (a decision that seems prompted in part by Sam's own shame of her). She goes to the schoolhouse to tell her children goodbye, and it is one of the saddest, most heartrending scenes, both for the reader and for Caddie, who can't contain her tears and lets them fall to the book that's open on her lap. For months, Caddie has been saving a silver dollar she received from her Uncle Edmund, and she finally knows exactly how she wants to spend it. The next day after school, she leads the three Hankinson boys to the general store and buys each of them candy, a top, a comb, and a handkerchief. She spends every last cent, and with each present, the boys' eyes light up a little more. Later that night, Tom questions her, "But Caddie, you needn't have spent your whole dollar. You could have got them each a top or a hoarhound stick, and kept the rest for yourself." But Caddie replies, "No, Tom, it had to be all of it. I wanted to drive that awful lonesome look out of their eyes, and it did, Tom. It did!" It was such a sweet, poignant lesson to me (and hopefully to my kids too). Caddie stripped away all the labels and prejudices heaped upon this family (even by Caddie's own mother) and saw them for who they really were: three little boys who desperately missed their mother. The shopping spree was fun, but the attention she gave them was even more meaningful. For just a few minutes, they no longer felt like outcasts but like royalty. Something similar happened a little later on in the book, but this time it was between Caddie and her younger sister, Hetty. Hetty is not a tomboy like Caddie. However, on occasion, she tags along with Caddie, Warren, and Tom but mostly just so she can turn on her heel at the least sign of mischief and run home to tattle to their mother. Consequently, the three adventurers avoid her whenever possible. One afternoon though, Caddie is by herself on the quiet hill north of the house. She has picked a bouquet of flowers and is braiding the stems together while she thinks and daydreams. Then she catches sight of Hetty, and her first thought is one of irritation. She just knows Hetty is coming to disturb her peace by spreading some bit of news she's discovered. But surprisingly, Hetty just takes a seat beside Caddie and says, "It's kind of nice to be just us two alone . . . isn't it? Without the boys. But I guess it's more fun for you with the boys." In just those few words, quite a lot is revealed about Hetty: "It was almost as if Caddie had never seen that little face before. Suddenly she understood for the first time that Hetty was all by herself. Minnie was too young, and Tom, Caddie, and Warren had no room in their adventures for a tagging and tattling little sister. Was her eagerness to be the first to tell only her way of trying to make herself important in the eyes of all the selfish older people?" The moment was so unexpected and sweet that it made me want to weep. For all of her energy and shenanigans, Caddie could be quite mature and perceptive. This was one of those times, and I felt like reaching through the page and giving her a hug when she said, "I think it's nicer since you came, Hetty. I really do." But if you asked my boys what their favorite part of the book was, it wouldn't be that moment of generosity toward the Hankinson children or this sweet glimpse of sisterly bonding. No, they would most definitely say, "Tom's story about Pee-Wee." One day while Caddie, Tom, and Warren are plowing a field, they decide to take turns telling stories to each other. Tom's story is about a greedy, quick-tempered, and rather heartless farmer named Pee-Wee who uses any misfortune to his advantage. My kids thought this story was so funny and, in a moment that will surely go down in our family's readaloud history, even asked me to read it again immediately after I read it the first time. A couple of weeks after we finished it, Maxwell brought home a paper from school detailing an upcoming assignment where they had to tell a story to the class. And what story do you think Max wanted to tell? Pee-Wee, of course. Now, as those of you who have actually read the story know, there are some rather morbid moments, which are meant to just be far-fetched and ridiculous, but which might sound rather disturbing coming out of a six-year-old's mouth. Luckily, I was saved because it took him ten minutes to tell, and he was only supposed to talk for two to four minutes (although, if you ever catch Max unoccupied, you will be in for a treat if you ask for his best retelling of Pee-Wee). Readers are always finding new coming-of-age stories to rave about, but I believe this one could rival just about any of them. Caddie grows and matures throughout the book without losing any part of herself. She is still the same brave, fiery tomboy we started out with, but by the end of the story, she is wiser and just a little softer around the edges. This is due in large part to her father, a man who maybe edged out Atticus Finch as "best father in all of literature" for me. He is gentle and perceptive and lets Caddie know he loves her simply because she is his Caddie. At the very end, Caddie makes this observation, "I'm the same girl and yet not the same. I wonder if it's always like that? Folks keep growing from one person into another all their lives, and life it just a lot of everyday adventures. Well, whatever life is, I like it." Is it any wonder that we all fell in love with Caddie? 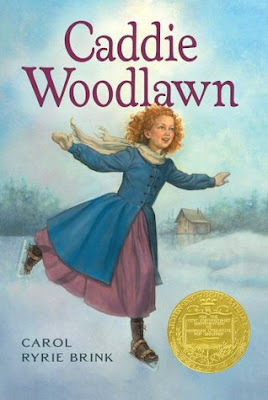 Have you read Caddie Woodlawn? What lessons did you learn? What was your favorite scene? Read Caddie to my older three, have such fond memories. They begged and begged for it. Read all day!! then we read the sequel. Did you like the sequel too? I've been debating reading it. I know my mom read this one to us when I was young, but apparently I remember nothing about it because nothing you mentioned sounded familiar. However, I was totally getting emotional just reading your descriptions of the sweet life-lesson scenes, so yeah, this one's now on my list. (Also, totally intrigued by the Pee-Wee story, sounds like a total read-aloud winner). There are definitely some sweet, tear-jerking moments in it. And yes, you're in for a treat (or a shock) with Pee-Wee, haha.